When did people start to thatch roofs? 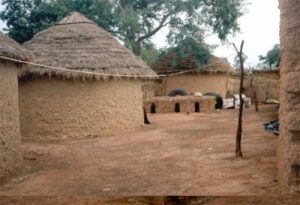 Most houses in ancient Europe, Asia, and Africa had thatched roofs. People have been thatching roofs since at least 10,000 BC, and maybe longer. What was going on in 10,000 BC? Thatched roofs are hard to make, and you have to re-thatch them every few years or they will leak, but the materials are cheap and easy to get. How do you thatch a roof? You take dried grass or straw and make it into small bunches, and tie each bunch with a cord spun out of the same grass. What is straw made of? Then you line up the bunches next to each other around the bottom of the roof, and push them together tightly. You have to get the tension just right so that the bunches will hold each other together. Then you make another layer higher up, overlapping the first layer, and so on until you reach the peak of the roof. Another problem of thatched roofs is that bugs and spiders and small animals like squirrels like to live in the roofs. One advantage of a thatched roof is that it will gradually let the smoke out, if you have a cooking fire inside your hut, so you don’t need to build a chimney. Still, when people can afford it, they usually choose to have a baked clay tile roof, which will last longer and keeps out the rain better. Cite this page: Carr, K.E. What is a thatched roof? History of Architecture. Quatr.us Study Guides, May 24, 2017. Web. April 26, 2019.